The brain has a remarkable capacity to record our daily experiences and recall this stored information to guide our behavior. For example, every time you decide to get a cup of coffee on campus, you immediately know where to go and then step toward your destination. The ability to successfully memorize paths and navigate in the environment is fundamental for animals searching for food (see Illustration), as well as for humans surviving in a complicated environment, especially when you don’t have your smartphone to rely on, but only your brain as the inner GPS! However, how does the brain learn and remember such plans that allow us to get from one place to another? We know that a structure in brain called the hippocampus plays an important role in encoding and storing memories. The hippocampus is thought to replay remembered experiences during fast, ripple-like brain waves, termed sharp-wave ripples (SWRs), that occur during “down-time” for the brain, i.e., offline periods during sleep and during pauses in active behavior. It has been previously shown by Jadhav and colleagues that selectively disrupting these ripple oscillations using precisely-timed electrical impulses impairs the ability of animals to learn in spatial mazes, suggesting that this “mental replay” is important for navigation and memory (Jadhav et al., 2012, Science). Notably, mental replay is not isolated activity in the hippocampus, but works together with the prefrontal cortex (PFC), the executive center of brain involved in storing memories and making decisions (Jadhav et al., 2016, Neuron). However, exactly how such memory replay supports memory processing in waking and sleep states had remained elusive. In a new article published in the Journal of Neuroscience (Tang et al., 2017), the Jadhav lab (the team included Neuroscience graduate students Wenbo Tang and Justin Shin) used high-density electrophysiology to record large numbers of neurons in both the hippocampus and prefrontal cortex in both sleep and awake states. They discovered that as rats learned a spatial memory task, the activity in the hippocampal-prefrontal network replayed recent experiences in a precise manner during SWRs that occurred when animals paused from actively exploring the maze. This structured mental replay related to ongoing spatial behavior is ideally suited for storing and retrieving memories to inform decisions. When animals were asleep after exploring the maze, the hippocampal-prefrontal replay, however, appeared “noisy” and mixed. 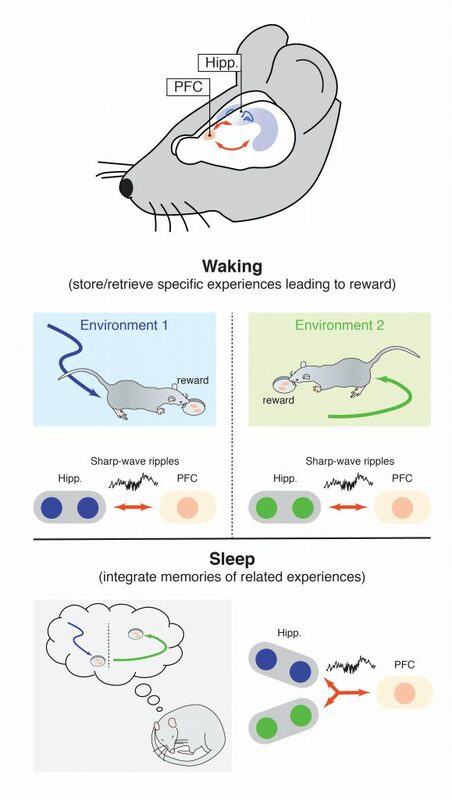 This replay occurring during sleep periods can support the ability of the brain to consolidate memories, by selectively integrating related memories to build a coherent map for long-term storage (see Illustration). These findings show how memory information is communicated between the hippocampus and PFC during ripple oscillations, and indicate that mental replay during sleep and awake states serve distinct roles in memory. These studies collectively provide fundamental knowledge about the neural substrates of memories. They will thus provide important insights into memory deficits that are prevalent in many neurological disorders that involve the hippocampal-prefrontal network, such as Alzheimer’s disease and schizophrenia. Hippocampal-Prefrontal Reactivation during Learning Is Stronger in Awake Compared with Sleep States. Wenbo Tang, Justin D. Shin, Loren M. Frank and Shantanu P. Jadhav. Journal of Neuroscience 6 December 2017, 37 (49) 11789-11805. Leslie Griffith and Gina Turrigiano have been named American Association for the Advancement of Science (AAAS) Fellows for 2017. This is in recognition of their contributions and scientific leadership in the field of Neuroscience. Leslie Griffith, Nancy Lurie Marks Professor of Neuroscience and Director of the Volen Center for Complex Systems, studies sleep and memory using Drosophila melanogaster. Gina Turrigiano is the Joseph Levitan Professor of Vision Science. Her lab studies the mechanisms of homeostatic synaptic plasticity and their effects in developing and functioning cortex. Vice Provost for Research Edward Hackett is also a 2017 AAAS Fellow in the Section on History and Philosophy in Science. Griffith, Turrigiano, Hackett and the other Fellows for 2017 will be recognized on Saturday, Feb. 17, 2018 at the 2018 AAAS Annual Meeting in Austin, Texas. Do you have trouble sleeping at night in the summer when it is really hot? Does a warm sunny day make you want to take a nap? You are not alone — fruit flies also experience changes in their sleep patterns when ambient temperature is high. In a new paper in Current Biology, research scientist Katherine Parisky and her co-workers from the Griffith lab show that hot temperatures cause animals to sleep more during the day and less at night, and then investigate the mechanisms governing the behavior. The increase in daytime sleep is caused by a complex interplay between light and the circadian clock. The balance between daytime gains and nighttime losses at high temperatures is also influenced by homeostatic processes that work to keep total daily sleep amounts constant. This study shows how the nervous system deals with changes caused by environmental conditions to maintain normal operations. Parisky KM, Agosto Rivera JL, Donelson NC, Kotecha S, Griffith LC. Reorganization of Sleep by Temperature in Drosophila Requires Light, the Homeostat, and the Circadian Clock. Curr Biol. 2016. Why humans and other animals sleep is one of the remaining deep mysteries of physiology. One prominent theory in neuroscience is that sleep is when the brain replays memories “offline” to better encode them (“memory consolidation”). A prominent and competing theory is that sleep is important for re-balancing activity in brain networks that have been perturbed during learning while awake. 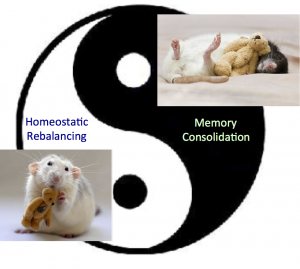 Such “rebalancing” of brain activity involves homeostatic plasticity mechanisms that were first discovered at Brandeis University, and have been thoroughly studied by a number of Brandeis labs including the Turrigiano lab. Now, a study from the Turrigiano lab just published in the journal Cell shows that these homeostatic mechanisms are indeed gated by sleep and wake, but in the opposite direction from that theorized previously: homeostatic brain rebalancing occurs exclusively when animals are awake, and is suppressed by sleep. These findings raise the intriguing possibility that different forms of brain plasticity – for example those involved in memory consolidation and those involved in homeostatic rebalancing – must be temporally segregated from each other to prevent interference. The requirement that neurons carefully maintain an average firing rate, much like the thermostat in a house senses and maintains temperature, has long been suggested by computational work. Without homeostatic (“thermostat-like”) control of firing rates, models of neural networks cannot learn and drift into states of epilepsy-like saturation or complete quiescence. Much of the work in discovering and describing candidate mechanisms continues to be conducted at Brandeis. In 2013, the Turrigiano Lab provided the first ­in vivo evidence for firing rate homeostasis in the mammalian brain: lab members recorded the activity of individual neurons in the visual cortex of freely behaving rat pups for 8h per day across a nine-day period during which vision through one eye was occluded. The activity of neurons initially dropped, but over the next 4 days, firing rates came back to basal levels despite the visual occlusion. In essence, these experiments confirmed what had long been suspected – the activity of neurons in intact brains is indeed homeostatically governed. Due to the unique opportunity to study a fundamental mechanism of brain plasticity in an unrestrained animal, the lab has been probing the possibility of an intersection between an animal’s behavior and homeostatic plasticity. In order to truly evaluate possible circadian and behavioral influences on neuronal homeostasis, it was necessary to capture the entire 9-day experiment, rather than evaluate snapshots of each day. For this work, the Turrigiano Lab had to find creative computational solutions to recording many terabytes of data necessary to follow the activity of single neurons without interruption for more than 200 hours. Ultimately, these data revealed that the homeostatic regulation of neuronal activity in the cortex is gated by sleep and wake states. In a surprising and unpredicted twist, the homeostatic recovery of activity occurred almost exclusively during periods of activity and was inhibited during sleep. Prior predictions either assumed no role for behavioral state, or that sleeping would account for homeostasis. Finally, the lab established evidence for a causal role for active waking by artificially enhancing natural waking periods during the homeostatic rebound. When animals were kept awake, homeostatic plasticity was further enhanced. What it is about sleep that precludes the expression of homeostatic plasticity? How is it possible that mechanisms requiring complex patterns of transcription, translation, trafficking, and modification can be modulated on the short timescales of behavioral state-transitions in rodents? And finally, how generalizable is this finding? As homeostasis is bidirectional, does a shift in the opposite direction similarly require wake or does the change in sign allow for new rules in expression? Authors on the paper include postdoctoral fellow Keith Hengen, Neuroscience grad student Alejandro Torrado Pachedo, and Neuroscience undergraduate James McGregor ’14 (now in grad school at Emory). Hengen KB, Torrado Pacheco A, McGregor JN, Van Hooser SD, Turrigiano GG. Neuronal Firing Rate Homeostasis is Inhibited by Sleep and Promoted by Wake. Cell. 2016. … [How are sleep and behavior] connected in the brain? Does sleep simply permit memory storage to take place, such that the part of the brain involved in memory just takes advantage of sleep whenever it can? Or are sleep and memory physically connected, and the same mechanism in the brain is involved in both? In a recent study published in eLife, researchers in the Griffith lab may have [uncovered the answer]. They found that a single pair of neurons, known as the DPM neurons, are actively involved in both sleep and memory storage in fruit flies. Haynes PR, Christmann BL, Griffith LC. A single pair of neurons links sleep to memory consolidation in Drosophila melanogaster. eLife. 2015;4.